The hatchback was the go-to body style of affordable compact cars in the last 70s and early 80s. Everyone loved them. But, somewhere along the line, that “affordable, compact” image turned into a “cheap, disposable” image and it took the hatchback down with it. That explains why the automotive media I grew up with in the 90s bemoaned the impending demise of the hatchback in America. Today, it appears the hatchback has returned, because GM, a company that is still erring on the side of caution (don’t forget, the bailout was less than a decade ago), got tired of watching the guys across the street roll hundreds of hatchbacks out the door day in and day out. 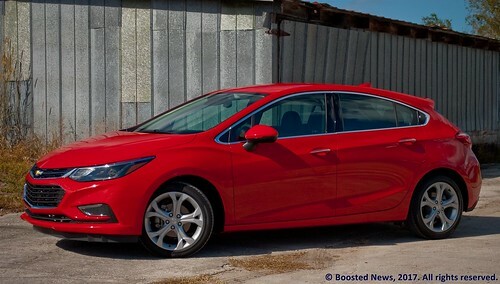 They finally decided to bring the hatchback body style of Chevrolet’s global compact car, the Cruze, to the United States. 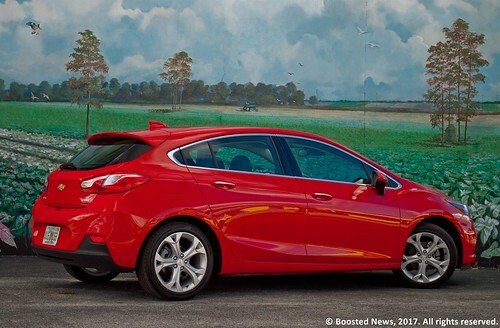 It’s a great-looking hatchback, too. The first Cruze sedan looked good, definitely better than the Cobalt. But it looked a bit angular and chunky next to its more attractive competition. Now, with the new model, the competition looks dated. The new Cruze 5-door isn’t revolutionary, and the front overhang is slightly larger than the rear, which almost never looks good. But this is one occasion where it doesn’t look bad. It’s handsome from all angles, and in all iterations. The RS appearance package improves upon it, but it still looks good without it. It actually looks European, something GM has been dying to hear for ages. 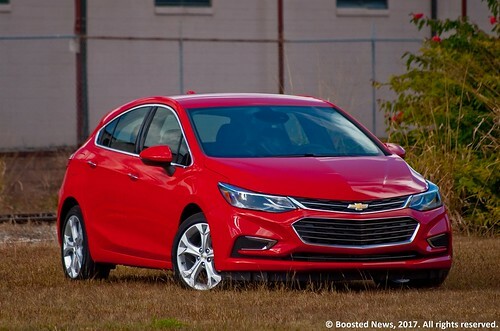 While the Cruze’s range of body styles has increased, its drivetrain options have done the opposite, as GM is fully embracing the downsizing-and-turbocharging trend. The old Cruze LT’s naturally aspirated 1.8L 4cyl has been culled, and the 1.4L turbocharged 4cyl has become the sole offering. It finally gets direct injection, which nudges the output up to 153hp and 177 ft-lbs of torque. A six-speed manual transmission is standard in all trims except my Premier test vehicle, which only comes with a six-speed automatic transmission. It’s hampered by GM’s awkward and sluggish manual gearchange buttons atop the shift knob, but the performance from the microscopic turbo engine is nonetheless admirable. 0-60mph takes 7.8 seconds, and the quarter mile is accomplished in 16 seconds flat at 85mph. That’s brisk compared to the Cruze’s rivals, and the torque bump is much appreciated in dense city traffic. It also is appreciated at the pump, returning 28.3mpg under my chronically heavy foot. One other option pertaining to the drivetrain that GM has removed is the driver’s ability to turn the new auto start-stop system off. Auto start-stop is becoming very common in the industry as emissions and fuel economy requirements get loftier. But while virtually all cars with have a button on the dash to disable the system, the Cruze does not. If the parameters for the system to operate are met (a mild HVAC setting, for example) the engine will shut off at a stop whether you want it to or not. Exclusive to the Cruze Premier is a Z-link rear suspension. The front is independent MacPherson struts as is customary, but while the lesser models make do with a simple torsion bar, the Z-link in the Premier braces the bar against the body with two additional links attached by a common pivot point. It virtually eliminates the bar’s side-to-side movement on rough roads or under hard cornering, which helps reduce tire sidewall flex. That keeps more of the tire’s tread on the road, which helps explain the very good 0.84g of lateral acceleration, but it also gives the Cruze Premier a feeling of solidity. Even my grandfather noticed the Cruze’s exceptional ride quality, after years of accustomation to the couch-on-wheels ride of his Cadillac DTS. Yet, body roll is minimal, and though it’s far from being a hot hatch, understeer is really only possible if you do something ridiculous. The Cruze strikes a far better balance between ride comfort and handling than anything else currently in this segment. The primary interference with the Cruze’s status as a hot hatch is the steering. Electric-assisted steering has all but replaced hydraulic-assisted steering by now, and many manufacturers have fine-tuned their electric steering systems to offer the needed amount of assist without sacrificing feedback. GM still hasn’t quite sorted it out yet, as the Cruze’s steering feels recalcitrant, like it will do what you ask of it, but on its own terms. GM continues to make strides in improving one of its past weak points: interior quality. The dashboard is thoughtfully laid out and its design is simple but easy on the eyes. The controls are definitely common with the GM family, and everything is where you would expect it to be. The Premier’s black leather seats can get quite hot during the summer months, but they are comfortable on long journeys and complement the smooth ride. With the exception of the hood release lever down under the dashboard, which feels rather flimsy, the fit and finish is finally proof that, even in a small, affordable car like the Cruze, GM is paying attention to the part of the car where people spend just about all of their time using it. The optional Driver Confidence II package gave my Cruze Premier a level of equipment I was only seeing on luxury cars a few years ago. Navigation, automatic high beams, forward collision warning, blind spot monitoring, and lane departure warning with the steering assist that will gently guide you back into your lane if you drift askew. That package doesn’t add much to the as-tested MSRP of $26,475 either. That’s a few grand higher than a similarly-equipped Focus, but the Cruze’s turbo engine has more torque than the Focus’ naturally aspirated engine. Furthermore, the Cruze looks sharp and fresh, while the Focus is growing whiskers. 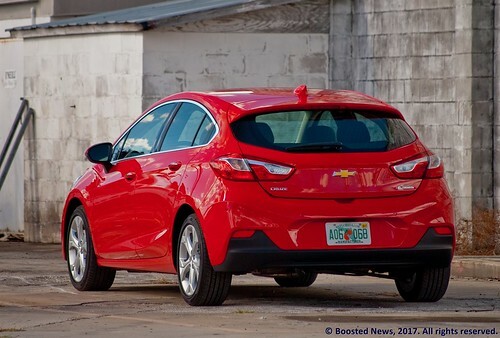 So, GM is once again a legitimate contender in the compact car category, and for the first time since the departure of the Cavalier wagon in 1994, GM’s compact car is available in a hatchback.